Catherine Smylie McGehee will lead one of the nation's preeminent girls' schools into its second century as the next Head of Foxcroft School, the School's Board of Trustees announced Monday. McGehee, director of the Upper School at St. Catherine's School, in Richmond, VA, succeeds the legendary Mary Louise Leipheimer, effective July 1, 2014, at the Middleburg, VA school. Leipheimer, whose visionary leadership has guided Foxcroft from a time of uncertainty to a position of extraordinary strength at the forefront of independent schools, is retiring after 25 years at the helm, and leading . Founded in 1914, Foxcroft is celebrating its centennial throughout this school year. A native Virginian, McGehee has spent the past 18 years at St. Catherine’s. Before being named Director of the Upper School in 2006, she served as chair of the School’s English Department (K-12) and taught English in the Upper School. Previously, McGehee taught English in Eden Prairie, Wayzata, and Burnsville, MN, and at Fluvanna County High School in Palmyra, VA. She also has been a frequent presenter at independent school conferences, including the National Coalition of Girls Schools and the Virginia Association of Independent Schools, and has lectured at the University of Richmond. McGehee holds a Bachelor of Science in English from Vanderbilt University and master’s degrees in English and Educational Leadership and Policy Studies from the College of William and Mary and the University of Richmond, respectively. 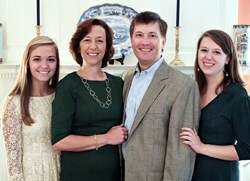 McGehee is married to Dr. Read McGehee III, an ophthalmologist, and has two daughters, Eliza, a recent Vanderbilt graduate currently pursuing a master’s at James Madison University, and Jane, a freshman at Davidson College. Foxcroft School (http://www.foxcroft.org ) is a college-preparatory boarding and day school for girls in grades 9-12 located just 50 miles west of Washington, D.C. Its 2013-14 student body is comprised of 165 girls from 21 states and the District of Columbia, and nine foreign countries. About one-third of the students receive financial assistance. Nearly three-quarters of the students are boarders and more than 80 percent of the faculty and administrators live on campus. Foxcroft offers 75 courses, including 15 Advanced Placement courses and an innovative STEM (Science, Technology, Engineering, Math) program. It fields athletic teams in nine sports, including a nationally-known riding program and Virginia state finalist field hockey and lacrosse teams. The 36 members of the Class of 2013 were offered 139 acceptances and nearly $ 1.2 million in merit scholarships from 100 colleges and universities in the U.S., England, France and Scotland, including Barnard, Cornell, UCLA, Washington & Lee, Virginia, and Virginia Tech.